Shooter Jen McIntosh has all but sealed a place at next year's Olympics in Rio. 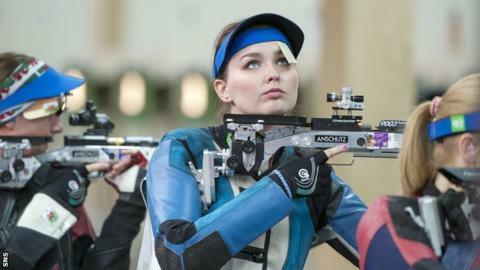 McIntosh finished fourth in the 50m rifle three positions at the European Championships in Slovenia, securing a quota place for British Shooting. She is almost certain to be selected but it's the place not the athlete that have qualified thus far. "It's the first time since the 80s that we will have a female rifle shooter at a non-home Olympics," Scot McIntosh, 24, told British Shooting. "I hope that my performance shows that it doesn't take any kind of black magic to get to become an Olympian, it's all about hard work and a relentless determination." "I've always wanted to win a quota place at the Olympics. "At London it [my place] was automatically allocated so it feels like I've really earned this myself through a lot of hard work and determination. McIntosh has won five Commonwealth Games medals in her career. After winning two golds and a bronze at Delhi 2010, she won a silver and another bronze last year in Glasgow. "I feel relieved at the moment," she added. "It's been quite a difficult season, I've come really close a couple of times, but to have done it now, it's that box ticked and I can relax a bit. "I felt a fair amount of pressure going into the match but I had a lot of experience to draw on to help me deal with that."